Another Blu-ray repackage job with a few additional trinkets is planned for November. 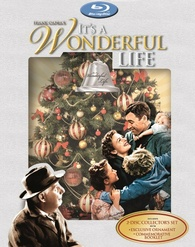 In an early announcement to retailers, Paramount has revealed 'It's a Wonderful Life: Collector's Edition Gift Set' will take a high-definition bow on November 1. The release will be exactly the same as the previously released edition, which included both the original black-and-white and colorized versions, it will just add an ornament, commemorative booklet, and new packaging. You can find the latest specs for 'It's a Wonderful Life: Collector's Edition Gift Set' linked from our Blu-ray Release Schedule, where it's indexed under November 1.